Summer is getting closer, which means the days are getting longer and especially warmer. It’s the time of the year where people spend more time outdoors than indoors. And also, people are more active. Hiking is a great and cheap way to discover the beauty Canada has to offer. So, here are some ideas of great hikes to do. In North Vancouver, there are many hiking trails. The Baden Powell Trail is one of the most famous ones. The trail is going through the entire North Shore mountain range. It is therefore linking several parks together along its way. The Baden Powell trail can be entered through different points. Depending on which entry is taken, a hike can take up to 5 hours. When entering the trail at Lynn Canyon Park, you can cross a suspension bridge (for free) and enjoy several wonderful views along the river. The Grouse Grind hiking trail is another well-known hike in Vancouver. 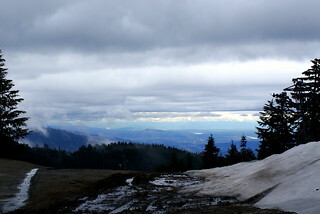 It is a 2.9km long trail that brings you to the top of Grouse Mountain. From there, you have a beautiful view over Vancouver. The trail is also known as ‘Mother Nature’s Stairmaster’ because there is a total amount of 2830 stairs to climb. The hike takes around 1.5 to 2 hours, depending on the skill level of the hiker. 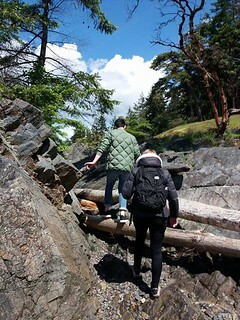 If you would like to get out of Vancouver, how about doing a hike on Bowen Island? For around $18 and 20 minutes on the ferry, you get on the island. There, you can do the Mount Gardener hike. Mount Gardener is the tallest mountain on Bowen Island with 719m elevation. The trail is a 10km round trip that offers a panoramic view of Port Mellon, the Sunshine Coast and Vancouver Island. There are several routes one can take to get to the top. The hike is not an easy one: it can take 5 to 6 hours until you’re at the top of the mountain. So, grab your hiking shoes, pack enough snacks and water in your backpack and discover one of many hiking trails Vancouver has to offer. See you all tonight at the Library Square for PuB NiGHT! My name is Nicholas and I am from Brussels, Belgium. I am 21 years old and I am finishing my third year of my marketing bachelor. I decided to come to Canada mostly to experience a different working environment and mentality, but also because I like traveling in general. Besides that Vancouver specifically was a city I wanted to visit. I found INTERNeX through a man named Jacques Allemeersch. He came to my school in Belgium talking about the possibility to do an internship in Canada or New Zeeland. So through him I came in contact with INTERNeX. I was placed for a practicum at a tour company located in downtown Vancouver. They do trips to the Rockies, Seattle, Tofino and more, and also organises parties and events. I really like it there! You need to be initiative and responsible here, and being charismatic and creative also comes in quite handy. The practicum is part of my university program and will very likely be a useful asset on my resume. During my stay in Vancouver I lived in a homestay, which INTERNeX found. My first impression of Vancouver was not that great because I really did not like my first homestay and also because there was an unusual snowstorm when I arrived. However, I really like the city now and wish I could have stayed longer. I have attended most of the pub nights the INTERNeX PR-team organises, and I think they are great (and necessary) as they allow you to meet other people in similar situations from all around the world. If I could give one recommendation, it would be to make some kind of introductory game at pub nights for new students so they get fully integrated. I didn’t participate in any trips however, mostly because I could do trips for free through my internship. Activities I did and places I visit are; hikes on the Grouse Grind, Lynn Canyon, Deep Cove and Lighthouse Park, I have been on tours to the Rockies, Seattle and Whistler. What I like most about Vancouver and Canada are the great outdoors, and the possibility to hike in the summer and ski/snowboard in the winter. The most memorable thing I’ve done here is probably playing ice hockey on Lake Louise. There were also some challenges during my stay in Canada, like understanding the prices and especially finding good food for a good price. I have already liked travelling prior to my stay in Vancouver, so it didn’t really inspire me to travel more, but I am definitely interested in coming back to Vancouver. INTERNeX was helpful for me because they helped me find an internship and a homestay, and it allowed me to meet more people from all around the world who are also doing internships or working, so I might recommend it to others. When I get back home I will first get back in touch with my friends and family, but I also have some administration to do to get ready for next year.